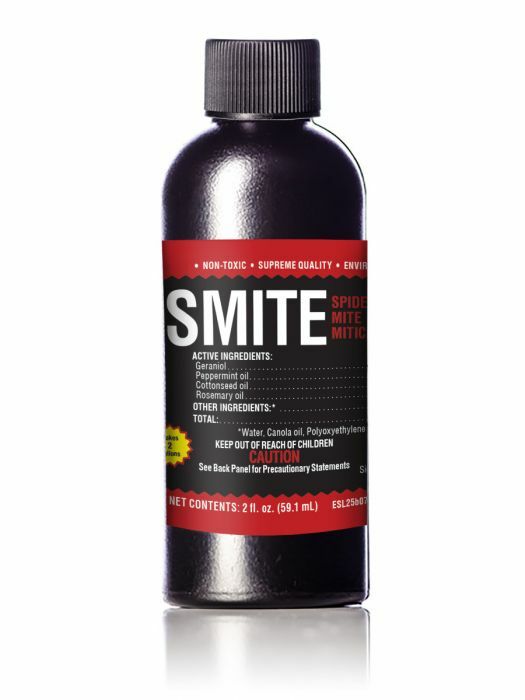 SMITE is the purest concentrate on the market. 2oz size makes 2 gallons of ready to use product. SMITE® by Supreme Growers® is a 100% all natural pesticide.- safe for all crops and stages from seed until flower. It is a pure concentrated all-natural pesticide formulated with a diverse blend of powerful plant oils that will kill spider mite eggs and adult infestations on contact. 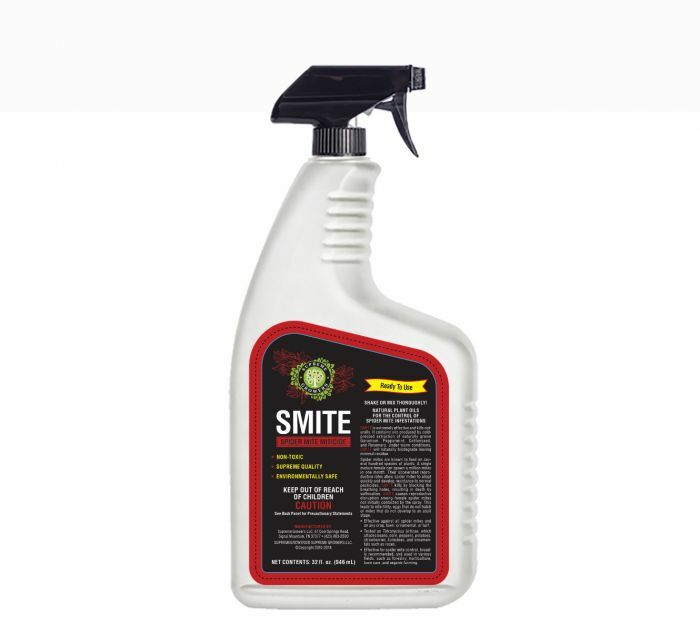 SMITE also eradicates and prevents aphids, thrips, leaf hoppers, russet mites, broad mites and other common soft bodied pests. SMITE is extremely effective, both on contact and preventative control. 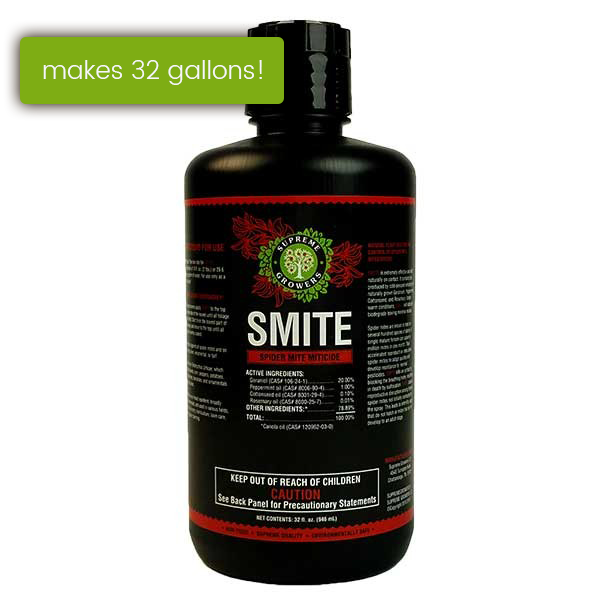 Formulated with 4 ultra-pure diverse food-grade natural “whole plant” oils, SMITE’s powerful ingredients are targeted to specific modes of action. 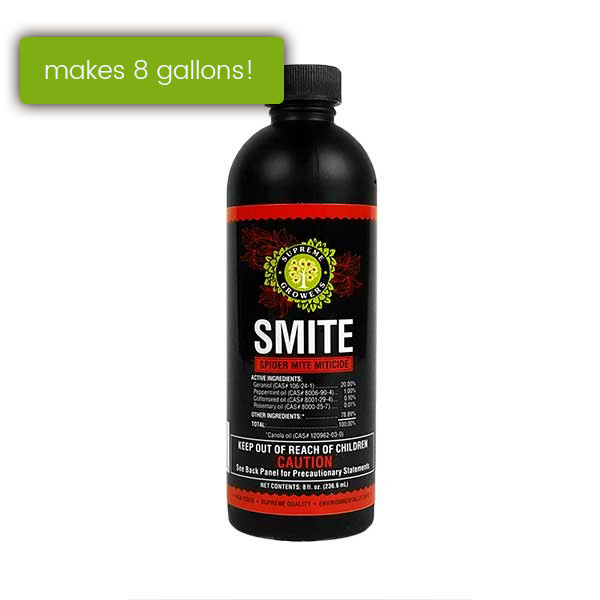 Smite has a Patented Micronization process that takes these normally bulky, heavy oils and shrinks them down to less then 1 micron in size. This allows the oils to penetrate into the abdomen and cause suffocation with higher efficiency. The Geranium, Peppermint, Cotton Seed, and Rosemary oils delivered by SMITE® are harvested and extracted with intention using cold-press methods in order to retain purity of ingredients. No heat or chemical solvents are used. We source our oils from Asia to guarantee the highest level of quality and to stay away from GMO’s. SMITE is fully registered and approved for all sectors of agriculture. Under warm conditions, SMITE® will naturally biodegrade leaving minimal to no residue. Perfect for vegetables, fruits, flowers etc. 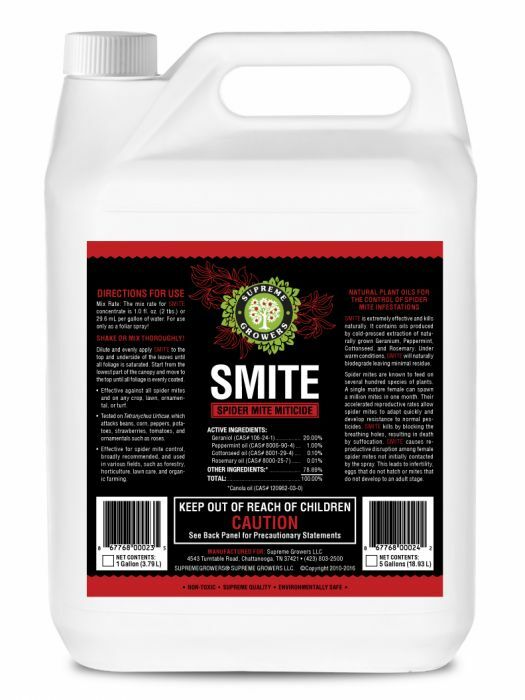 Spray SMITE on plants of every age, from seed/clones through harvest. Unlike other products, spider mites do not get immune to SMITE. Can be sprayed up to and past harvest given the proper amount of time to dry before making extracts and/or consuming. Click “Add to Cart” to order SMITE® now. At Supreme Growers®, we believe that quality starts at the soil. Our mission is to equip growers with the knowledge and resources to make self-sustainable growing economically viable. That’s our commitment to you. Natural plant oils for the control of Spider Mite infestations. SMITE is extremely effective and kills naturally on contact. It contains oils produced by cold-pressed extraction of naturally grown Geranium, Peppermint, Cottonseed, and Rosemary. Under warm conditions, SMITE will naturally biodegrade leaving minimal residue.